Age-related memory loss does not have to be inevitable. Adults 65 and over are the fastest growing population and are living longer than ever. Of course, they want to live life to its fullest. Maintaining good health and mental clarity is instrumental in healthy aging. The mission of Sarasvate is to help each and every aging adult – those living independently, with assistance, or with memory-impairment issues – to achieve the highest quality of life possible. Sarasvate – Think of it as a health and wellness learning experience. 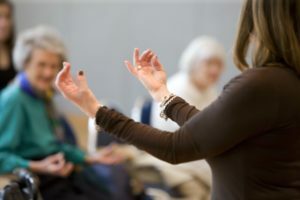 Through workshops, private sessions, and informative speaking engagements, seniors and caregivers will learn specific tools that enhance brain function and engage the mind and body. How certain aspects of our lives create stress and what that means for our bodies and our brains. Breathing techniques to maintain calm, improve sleep, energize and activate – all related to good cognitive function. A specific 12-minute meditation, researched by our friends and colleagues at the Alzheimer’s Research and Prevention Foundation (ARPF), that improves memory, brain function and overall wellbeing. 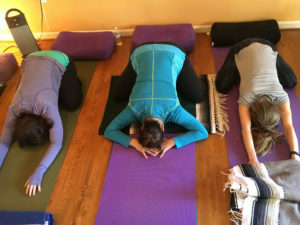 Gentle yoga stretching to keep the body open and flexible, adapted to a group that is fully mobile or confined to a chair. lecture-style, seated in chairs, include some gentle stretching. No mats or work out clothes required. includes a 30-40 minute yoga practice on mats. Dress for easy movement. Suitable for beginners and all levels. A valuable program for senior living communities and community centers. 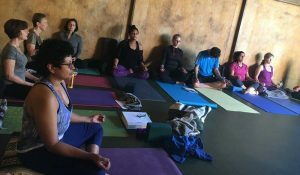 Many of the communities and centers I work with have incorporated a Sarasvate workshop into their health and wellness programs because of its many benefits for the mind and body and its alignment with their own mission to provide residents, their families, and community members with resources and services that improve quality of life. They’ll learn easy, practical tools that can be incorporated into everyday routines, how to live with greater vitality and clarity, and how to use mindfulness, movement, and breath to reduce stress and anxiety and increase focus. 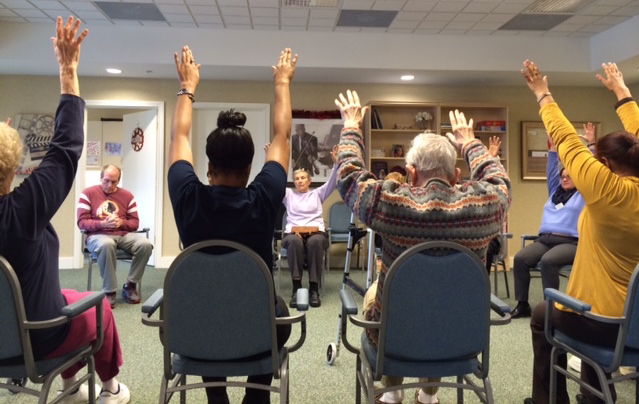 Caregivers and residents stretch together before meditation. Sarasvate can provide excellent training and support for caregivers or those who manage caregivers, or someone that cares for a family member who is memory impaired. I understand, from my own personal experience, the many professional and personal challenges that face caregivers. When my own mother was battling Alzheimer’s, we practiced specific breathing techniques that would enable her to feel more stimulated and energized each morning. I often wished the staff at her assisted living community had these tools at their disposal, and that in turn motivated me to design the Sarasvate program for those with memory-related issues and those who work closely with them every day. Sarasvate will help put you at the forefront of care. You’ll learn new techniques and tools to deal with especially anxious times such as sundowning, the challenge of helping someone get motivated in the morning, or generating focus for daily activities. Caregivers will also learn ways to cope with their own stress levels. We all know the responsibility comes with quite a bit of stress and they are often at risk for health issues themselves. To bring a Sarasvate workshop to your community, or hire Jane for a private session or speaking engagement, contact us.